Window shades provide a fashionable way to add great visual appeal to any room while also serving as functional protection from solar damage. They can block the sun from damaging your interiors without totally obstructing your window's natural view. 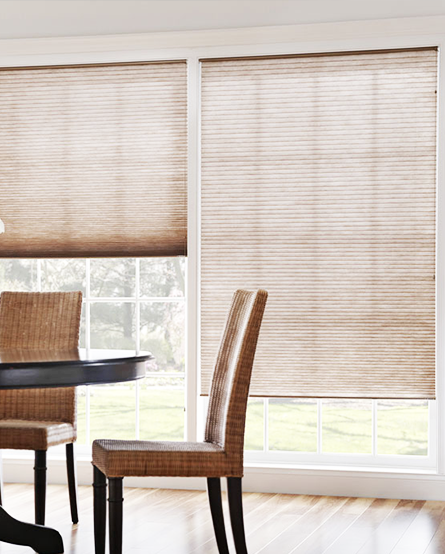 To learn how Custom Blinds By Gary Twiggs can help install shades for your next renovation project, contact us today. Screen shades are the closest match to traditional cloth. They add warmth and character while allowing the control of natural light entering the room. This is a popular choice for high-rise condominiums and residential applications. Carry the natural beauty of wood from your furniture to your window coverings. Rich in character, natural wood shades are right for every decor. Select from a full range of privacy or open weaves. Our natural woods are a stunning combination of simplicity, sophistication, versatility, and value. Roman Shades are durable and versatile window treatments that combine the softness of fabric drapes and the tailored look of a shade. Roman Shades are commonly used as an alternative to traditional curtains, and their many subtle style variations make them ideal for nearly any room in the house, including doors. Roman Shades are easy to operate and maintain while adding the beauty and elegance of naturally filtered light.